Eilenberg’s musical career began with the study of piano and composition, but he was able to play most wind and string instruments. He was born in Germany and at the age of 18 wrote his first work, a concert overture. 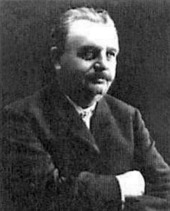 He became director of music and conductor in Stettin in 1893 and established himself in Berlin in 1889 as a freelance composer. He toured widely in the Nordic countries, Italy and Russia. He composed marches and dance compositions for both orchestra and military band and wrote a ballet The Rose of Shiraz. He composed the operettas Countess Cliquot, King Midas, Marietta and The Mad Prince. However, his most everlasting pieces were for salon orchestra, the most famous being Petersburger Schlittenfahrt and The Mill in the Black Forest. Eilenberg left some 350 compositions and the fact that his music, although romantic in nature, was sometimes rather unsophisticated by no means detracted from its popularity at the time. Another forgotten work, J’y pense was recorded for the CD Spirit of Vienna.